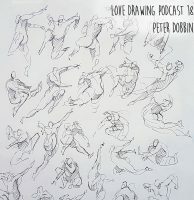 The Love Drawing podcast is all about drawing and the process of learning to draw. We talk over technique and mindset. In this episode we discuss drawing faces and getting likenesses, a difficult task for the most seasoned artists. We also look back on our experiences with the challenges we put on ourselves in the last episode – Mayko drawing with ink pens, and Kenzo drawing leg anatomy. If you enjoy the episode, please subscribe and leave us a 5 star review. Also, check out our newsletter below – you’ll get tips and food for thought on life drawing every 2 weeks.